Ransomware is a malicious malware that blocks access to a computer or its data and demands money to release it. When a computer is infected, the ransomware typically contacts a central server for the information it needs to activate and then begins encrypting files on the infected computer with that information. Once all the files are encrypted, it posts a message asking for payment to decrypt the files and threatens to destroy the information if it doesn’t get paid, often with a timer attached to ramp up the pressure. Most ransomware is spread hidden within Word documents, PDFs and other files normally sent via email, or through a secondary infection on computers already affected by viruses that offer a back door for further attacks. 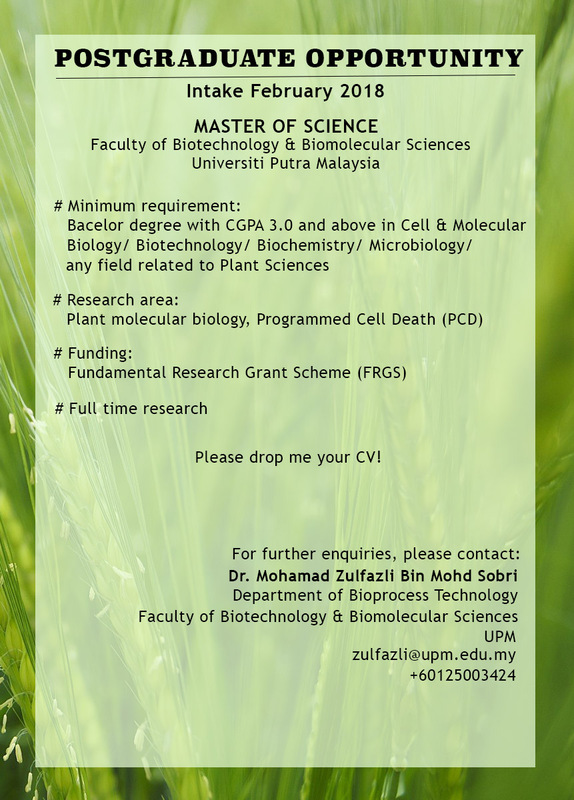 DATE : VIVA ROOM 1, SCHOOL OF GRADUATE STUDIES 1, UPM. Dengan hormatnya dimaklumkan bahawa Mesyuarat Pengurusan FBSB kali ke 235 telah bersetuju supaya semua kemudahan dan makmal di FBSB ditutup sepenuhnya sempena sambutan Hari Raya Aidilfitri pada 24 Jun hingga 30 Jun 2017. Walaubagaimanapun sekiranya terdapat keperluan, sebarang penggunaan kemudahan dan makmal hendaklah mendapatkan surat kebenaran dari Ketua Jabatan yang terlibat. All new graduate students (First Semester 2017/2018) please be informed. There is a breifing by the Deputy Dean (Research and Postgraduate Studies) and the Science Officer at 27th September 2017. Greetings from Beijing Institute of Technology! Beijing Institute of Technology is a top university in science and technology in China. We now offer a comprehensive course system in the areas of science and technology as well as management and humanities to degree-seeking students and exchange students across the globe. We also established a complete and powerful scholarship system to support foreign students to study in BIT. In order to promote international partnership and promote our programs, we’d like to provide the following scholarship to your students. 1. For degree-seeking programs, we provide the CSC (China Scholarship Council) Scholarship for 3 master and PhD candidates from your prestigious university. This is a full scholarship for foreign students. 2. For exchange programs, we offer the BIT Exchange Scholarship to 3 exchange students at all levels from your university to study in BIT for one or two semesters for the academic year 2018-2019. Please refer to Attachment I for the details on the coverage and contacts of the above-mentioned scholarship programs. A Preview of 2018 Courses is now available for you and your students to review on our website. (Available here) More detailed course descriptions will be available on March 1st. Online enrollment for Summer 2018 will be available beginning on March 1st, so mark your calendars! Students and partners can enroll online at the convenience of their own computers. Ten new UCI Mentors have been selected, and will begin training very soon. 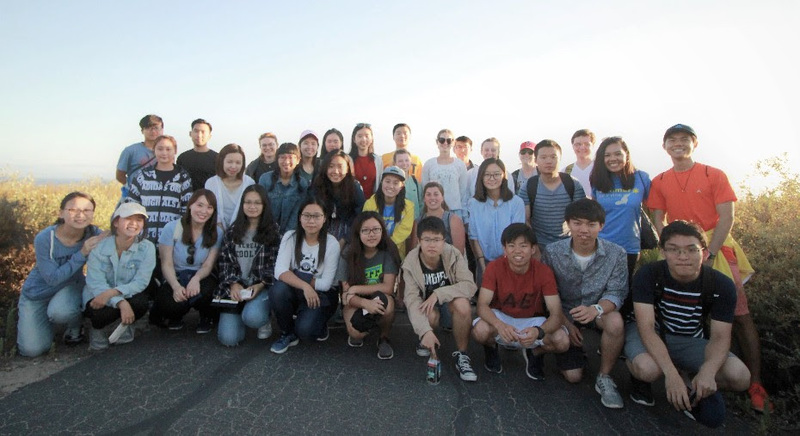 These excited and open minded students will be helping your students with their academic and social lives, and getting acquainted with American culture from the day they arrive at the airport, until the day they depart. As we move closer to March 1st , we would like to remind you and your students that our office is always available to help out in any way that we can with questions and/or additional information. We at Summer Session strive for nothing less than exceptional customer service, with genuine sincerity. Have a wonderful week, and again, Happy 2018! Want to stay up to date with Michael and his travels? Check-out his travel calendar, Where in the World is Michael Lyons, for updates on dates, times, and locations he is visiting! All partners are given a special link to access the UCI cloud server. 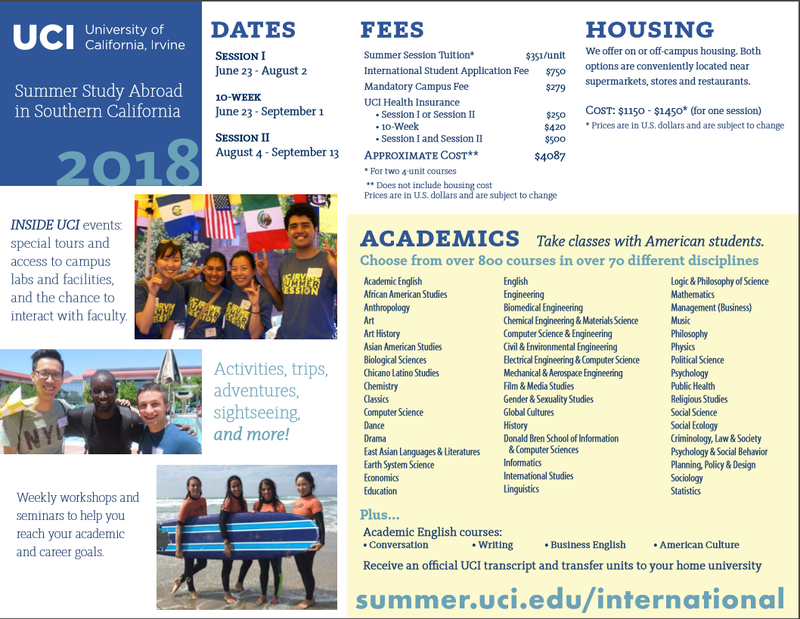 The cloud server contains helpful information and tools for your website and promotion of the UCI Summer Session Program. In the University of Guanajuato we are glad to announce our nomination guidelines for the Semesters: August-December 2018 and January-June 2019. You can find the detailed Fact Sheet attached, a preview of such information is in the following lines. Length of academic stay. One or Two semesters. Please include the following statement: “I confirm that (student name) has financial means to afford living expenses of at least $5,000.00 MXN pesos monthly. Dimaklumkan bahawa pihak Kokugakuin University, Jepun telah mula membuka pencalonan bagi Program Pertukaran Pelajar kemasukan september 2018-2019. Dilampirkan maklumat lanjut berkaitan program ini untuk rujukan pihak tuan/puan. Tarikh tutup permohonan adalah pada 28 Februari 2018 (Rabu) jam 5.00 petang. Calon yang telah menghantar permohonan (Borang Application For Study abroad, No 4), akan dipanggil untuk sesi temuduga pada satu tarikh yang akan ditetapkan. On behalf of the management and the staff of Hitit University, I would like to take this opportunity to express our gratitude for signing the Mevlana Exchange Program Protocol, which enables the exchange of students and academic staff between our universities. The funding of the incoming/outgoing students and academic staff mobility within the scope of Mevlana Exchange Program is met by Turkish Higher Education Council. The calendar of the Mevlana Exchange Program for the 2018-2019 Academic Year has been announced on the website of Higher Education Council Mevlana Exchange Program Coordinatorship at http://www.yok.gov.tr/web/mevlana. We would greatly appreciate if you could nominate the applicants and get us notified of the successful applicants in written until 6 March 2018. We should be grateful if you would use the application forms in the attachment for students’ and academicians’ applications. We kindly require you to read Board Decision and Guide attached carefully. With this letter, I hereby wish to cordially thank you for your support and interest in the program. Furthermore, I would like to point out that it would be a pleasure to host you at our university. Finally, the applications have also started in Hitit University for outgoing students. We would appreciate if you could state special requirements for our students who may be accepted to your university. It is my great pleasure to introduce the 2nd Walailak University Cultural Camp 2018 (WUCC2018) in the theme of “In Honour of HRH Princess Chulabhorn Walailak: Cultures without Borders”. The camp will be held between 16th - 23rd June 2018 at Walailak University, Nakhon Si Thammarat Province and Bangkok, Thailand. I would be very grateful if you could disseminate this information among your students. Türkiye Scholarships application periods for the year 2018 have been updated and applications are currently underway. You will find information about application dates, application requirements and procedures in the attachment above. Please feel free to disseminate our announcement and promotional materials to persons and institutions of interest. You may also contact us through info@turkiyeburslari.gov.tr if further information is required. Greetings from the National University of Singapore! We are pleased to share with you the newly formed Global Relations Office (GRO) at NUS, which is a result of a consolidation and re-organization of the University & Global Relations (UGR) Office and the International Relations Office. Since 1 January 2018, GRO oversees, manages and undertakes the promotion of the University’s global relations, as well as the advancement of NUS’ global vision with respect to the engagement of partners and institutions worldwide. Like previous years, we are delighted to work closely with you again for your student nominations for the Temasek Foundation International Leadership Enrichment and Regional Networking (TF Int’l LEaRN) Programme @ NUS for Academic Year 2018/2019. This programme aims to nurture the next generation of Asian leaders by providing opportunities for cultural exchange, networking, community engagement and leadership development to students during their exchange at NUS. Many of your students have benefited through their participation in the programme at NUS in the past years. For more information about TF International and the TF Int’l LEaRN Programme at NUS, please visit our websites at http://www.temasekfoundation-international.org.sg/ and http://www.nus.edu.sg/iro/fa/sch/in/tfilearn.html. The TF Int’l LEaRN Programme will run in Semester 1 (August-December). Under this programme, students can expect to receive S$6,500from TF Int’l to support their living expenses in Singapore. Students will also take part in various activities organized under the programme, including an English course, Service Learning Workshop, Temasek LEaRN Journey – a get-to know session with Temasek Holdings and TF Int’l, and the Young Asian Leaders Forum. We are excited to have your excellent students join us again this coming semester! Each university is invited to nominate up to 4 students for the TFI LEaRN Programme @ NUS 2018. Kindly complete the attached nomination sheet, with the nomination rank and submit it to tfil.ib@nus.edu.sg by Wednesday, 21 March 2018, or earlier. Nominated students are required to submit their supporting documents to your office as early as possible (You may wish to give your students an earlier submission deadline for your collation). Thereafter, you will need to verify the authenticity of the supporting documents and submit the scanned copies to tfil.ib@nus.edu.sg by Friday, 13 April 2018.
q If applicable, copy of TOEFL/IELTS/certified English language test by the home university - for applicants who are from non-English medium universities. Nominated students are required to submit the TFI LEaRN online application at https://mysurvey.nus.edu.sg/EFM/se/543BE5C21F6CE913. When the student clicks “Save” in any of the application pages, a unique URL link will be given – students should retain this link and keep it confidential (as it contains their responses) and use it to edit their application details. Students can edit their application details any time before they click “Submit” and before the deadline of Friday, 13 April 2018. Once ready, students must remember to Submit their application by the deadline so that the application is received by NUS. Nominated students must complete the NUS Non-graduating Exchange Programme application form at https://myaces.nus.edu.sg/ngAdmForm/ between 21 March and 15 April 2018. This form is required in order for us to process the students’ application to study at NUS for one semester. If this form is not completed, then the TFI LEaRN Programme application will automatically NOT be considered. the award within 1 week after receiving the offer. By mid-June, the Registrar’s Office will notify the students on the outcome of their NGE application, more specifically on their module selection outcome. As an additional note, students who are not eventually selected for the TFI LEaRN Programme @ NUS will not be eligible to proceed with their application to do an exchange programme at NUS in Semester 1 with a fee waiver. These students may, however, consider to apply for Non-Graduating Non-Exchange which requires them to pay the NUS tuition fees for the semester that they are enrolled at NUS. Alternatively, students may be nominated by their home universities under the AUN-ACTS exchange agreement, which allows students to be nominated through the AUN-ACTS portal to come to NUS for exchange (with tuition waiver) in Semester 2 (Jan-May). However, places for the AUN-ACTS nominations are very limited and therefore very competitive. For your easy reference on the application process, please refer to the flowchart attached . For more information on the exchange programme at NUS, key contacts, academic and module matters, please refer to the attached NUS Information Sheet for SEP in AY2018/2019 at http://www.nus.edu.sg/iro/doc/prog/sep/nus_sep_information_sheet.pdf. If you have any questions, please do not hesitate to contact us at tfil.ib@nus.edu.sg. Thank you and we look forward to receive your nominations and the students’ applications soon! Fakulti Bioteknologi dan Sains Biomolekul akan menghadapi audit indeks Akauntabiliti pengurusan kewangan tahun 2018 pada 3 & 4 Mei 2018. Kaedah yang digunakan untuk membuat penilaian secara objektif ke atas pematuhan pengurusan Kewangan Pusat Tanggungjawab. Selain itu, objektif audit ini dijalankan adalah untuk memastikan PENGURUSAN KEWANGAN PTJ dilaksanakan secara teratur dan mematuhi UNDANG-UNDANG & PERATURAN KEWANGANyang telah ditetapkan serta rekod yang berkaitan diselenggara dengan lengkap dan dikemaskini.Ianya juga merupakan MATLAMAT KE-5 PELAN STRATEGIK UPM (2014-2020) untuk mempertingkatkan amalan tadbir urus. Disamping itu, HASIL PENILAIAN AKAN DIGUNAKAN oleh pihak Universiti sebagai salah salah satu kriteria/elemen HARI KUALITI DAN INOVASI PERKHIDMATAN. Bersama-sama ini dilampirkan dokumen untuk perhatian pihak tuan/puan sebagai rujukan untuk menghadapi audit indeks akauntabiliti ini. Untuk pengetahuan pihak tuan/puan keputusan skor audit tersebut telah dijalankan secara kendiri oleh PTJ pada Oktober tahun 2017. Oleh yang demikian, mohon pihak tuan/puan untuk mengambil maklum dan bersedia dalam menghadapi audit indeks akauntabiliti ini. Perhatian dan kerjasama pihak tuan/puan amatlah dihargai. SELAMAT MENGHADAPI AUDIT!!! Dimaklumkan bahawa Prapendaftaran secara online bagi Semester Pertama 2018/2019 akan dilaksanakan bermula 7 Mei hingga 27 Mei 2018 melalui portal pelajar (smp.upm.edu.my). Minit JPU 642.01, mengambil perhatian mengenai hari kelepasan am tambahan yang ditetapkan oleh pihak Kerajaan pada hari Rabu, 9 Mei 2018 sempena hari mengundi bagi Pilihan Raya Umum Ke-14. Pengisytiharan cuti umum ini dibuat berdasarkan seksyen 8 Akta Hari Kelepasan 1951 bagi Semenanjung Malaysia dan Wilayah Persekutuan Labuan. Audit akan diadakan pada 21 Mei 2018 jam 9.00 pagi manakala Mesyuarat Penutupan Audit akan diadakan pada 25 Mei 2018 jam 4.00 petang di Dewan Senat. Greetings from Miriam College! I am pleased to send you some information on 5 short exchange programs for groups of students who may wish to visit the Philippines through Miriam College. Program fees of USD350 include airport-school transfers, accommodations in campus residence hall, materials, breakfast and lunch, workshop and field trips. from 1st September until 15th October 2018. Please see the attached application information for the detail. for the exchange program Spring 2019. 1. Register yourself and make your account on the website above. You will need to give the following "Account Registration Code". are often asked from your students about it. 2. Fill in the on-line application form and register the content. 3. Make PDFs of necessary documents and upload them on the website. 4. International Center will check the uploaded documents. and printed application form until then. Please do not post the original documents until we ask to post it. Some of these classes are subject to change in 2019. Universitas Indonesia invites every AUN+3 member university to send 2 (two) students as the representatives from each University to join this program. Universitas Indonesia will give full scholarships for 30 students as a first come first served basis one student from each university. A program fee of 500USD/ person includes airport transfer on departure and arrival, meals during the program (exclude dinner), program materials, certificate of participation and cultural activities during the program. Each university could nominate 1 student to get the scholarship. Each university may indicate which student that is nominated for full scholarship. Others participants will only need to pay for the program fee, while UI will give scholarship to cover the accommodation fee (280USD). The accommodation scholarship will be available for 10 participants. ”AUN STUDENTS WEEK” is a two-week mobility program. Designed to facilitate undergraduate students from AUN+3 universities’ member to participate on a short program with an opportunity of earning 3 credits (with 44 contact hours) upon completion. The program will be conducted in the form of in-class lectures (with multidisciplinary study approach), cultural sessions, field study/short internship to some institutions related to the lectures taking during the program and cultural trip. In this program, participants will not only have a chance to broaden their knowledge but also experience different cultures of ASEAN. In this regard, UI would seek your kind cooperation to nominate 2 undergraduate students as your university representatives to join this program. 2. Fill the application form on http://international.ui.ac.id/aun-students-week.html and upload the necessary documents. We receive the application until 23th September 2018 at the latest. If you haveany queries, please contact Ms. Lady at email: ladyfarisco@gmail.com or phone number: +6221 7888 0139. Can't wait to welcome your students in our university. Warmest greetings from Asian Youth Leaders Travel and Learning Camp (AYLTLC) 2019. It is our 8th Year! We are hereby honored to invite students from your highly esteemed institution to participate in the AYLTLC 2019, which will be held in Singapore from 14th to 18th February 2019. Once again, we would like to express our heartfelt gratitude and we look forward to your support for this Camp. Should you need any further clarifications or assistances, please feel free to contact us. Thank you and see you in Singapore! Attached please find the official letter along with application guidelines in English and Japanese and application forms. Forms are also linked to the section "How to Apply" "Items to be submitted" on Page 2 of the guideline. Application must be submitted by postal mail by November 30, 2018.
sized 4cm X 3cm. It sometimes happens that the application is rejected by Immigration Office because the photo size is not suitable. Also, postgraduate students need to apply for each graduate school directly. Greetings from Chonnam National University, Korea. We are planning to invite international scholars to our CNU International Summer Session 2019. Please refer to the email below from Dean for International Affairs of CNU, Professor Kiseok Moon. Your assistance in spreading a word to the faculty members in your institution about this visiting scholar program will be very appreciated. For the CNU International Summer Session 2019, your institution is invited to nominate up to a total of three (3) applicants. Please be noted that CNU cannot accept the applications if there are more than three (3) applicants. CNU does not accept individual applications for this program. Applications sent directly to CNU not through the international office of your institution will NOT be considered. If there is any applicant, please collect the following documents and send them to Ms. Shinhye Kang(shannon@jnu.ac.kr / ISS Coordinator) by December 3, Monday via email. This is Kiseok Moon, Dean for International Affairs at Chonnam National University, Korea. In 2018, CNU offered 24 courses in our International Summer Session, for which we invited 14 international scholars and 10 CNU professors to teach and 130 international students from 22 countries to study along with 400 local students. For the summer of 2019, we are again planning to invite scholars and students to our summer program, which will run from June 26 to July 23, 2018. Course topic: General courses are preferable to attract more students. Please do not hesitate to contact us, should you have more inquiries. Applications are now open for Leeds International Summer School (LISS) 2019: www.leeds.ac.uk/summer. Study at the University of Leeds and immerse yourself in British culture as part of an exciting four-week programme. LISS combines world-class tuition with academic field trips and includes social activities and cultural excursions. If you are unable to attend for the full duration there is an opportunity to join the wider group for two weeks of the programme. Please contact us to find out more. Earn credit and choose from academic subject areas including Arts & Humanities, Business, Communication, Computing, Design, Engineering, Politics & International Studies, Sciences and Social Sciences: www.leeds.ac.uk/summerstudy. The programme fee is £3,145. Scholarships are available as well as an early discount for applications received by 1 April. The fee includes tuition, on campus accommodation, breakfast and lunch Monday – Friday, premium gym membership, academic field trips, cultural excursions and a social programme. Please do not hesitate to contact us if you have any queries: summer@leeds.ac.uk and follow us on Facebook andInstagram for regular updates. We look forward to welcoming you to Leeds next summer! Greetings from Prince of Songkla University (PSU), Thailand! possible, but no discount will apply. 2018, we may close the applications once the seats are fully booked. - 30 April: final date for completing the payment. brochure for your further perusal. Thank you for your kind coordination and we look forward to hearing from you. Opportunity: Studying at UGM with Scholarship! this email finds you well. with talented minds in ASEAN to advance our society through education. Kindly share this invaluable opportunity to your students and alumni. for this year's application is 21 December 2018.
see this as of their interest. Best wishes from the Nanyang Technological University – University Scholars Programme (NTU-USP)! The NTU-University Scholars Programme, supported by Temasek Foundation International, will present the inaugural STEP Youth Regional Affairs Dialogue 2019. This Dialogue will be a platform for university students in Asia to enhance their leadership skills and broaden their understanding of geopolitics. Aspiring youth leaders will have an opportunity to develop an appreciation of Asia’s interwoven geopolitical structure through discussions on economics, politics and society. The objective is to foster an understanding of governance and policies across Asia as they build friendships through cross-cultural exchanges. The 8-day programme will be held from 2 - 9 August 2019 at the NTU campus. Applications will begin in January 2019, and selected students will be informed of their successful offers by mid-March 2019. We would like to encourage you to disseminate the email below to your students who meet the criteria and have the passion to share their knowledge about their home country. A set of application documents together with a copy of the factsheet are attached for their information. For more questions, please do not hesitate to contact us at dialogue@ntu.edu.sg. We look forward to welcoming the successful applicants from your university in August 2019. Greetings. I am pleased to inform you that the electronic versions of 2019 Inha Summer School brochure and poster are available now. Enclosed please find the brochure and poster files. I will also send them out by post as well. As you can see in the files, Inha University will offer more K-Pop related courses next year, such as K-pop dance, acting and cinema. In order to recruit more students, the university has decided to offer free 3 week accommodations and a free flight ticket for those who recruit a large number of students. If you can send us 10 students or more, you will be provided with free 3 week accommodations in the student residence. If you send out 20 students or more, you will be offered a free flight ticket (two way) in addition to free 3 week accommodations in the student residence. If you have any questions about the program, please feel free to contact me anytime. Thank you very much! We are happy to offer a GSP tuition fee discount of 10% to all your students, should there be 6 or more sign-ups from your university. Should you wish to promote this programme on your university website, we would be happy to send our website information pack for your use. We hope you could share our appended eDM below and the attached e-brochure with all your undergraduates and recent graduates. Should you require hardcopies of the GSP brochure, please let us know who we should mail this to and provide us with your mailing address. We sincerely hope to work with you on the above and look forward to receiving and hosting your students at the SMU Global Summer Programme 2019. Greetings from the International Center at Kanagawa University! As we have already sent you the invitation letter with the program leaflets, we would like to announce you again that our“Kanagawa University Japanese Language and Culture Program”will be held in summer 2019 and winter 2020. This program is designed to provide the opportunity to learn Japanese language and culture to students from all over the world. Please kindly note that target participants are from absolute beginner to pre-intermediate (N3/Level3 or less in Japanese Language Preficiency Test.) Beginners are welcome! We would like to invite two students from your university for each of the programs (summer and winter) and halve the participation fee (partner university discount)* for the students recommended. We would be very grateful if you could nominate if you could nominate two students by March 29, 2019, for the summer program and September 30, 2019, for the winter program and send the application documents for both students with the "Letter of Nomination" attached to the this email. We ask your cooperation to announce this opportunity to your students as much as possible. Please contact us if you have any queries or require further information. The application deadline is February 25th, 2019. For the detailed information, check the points 1 to 6 below. 1. The application documents can be downloaded from the following URL. 4. We included a pair of checklists in the necessary documents list. there is no missing documents before you send the application documents. We would like you to submit the checklists as well. Should you have any questions, do not hesitate to ask us. please forward this email to a responsible department. We are now ready to accept your students in our a tuition-waiver English-medium Summer Program in July 2019. Please refer the following web site. I would be very pleased if you would forward it to your various international offices so they can alert students. I am looking forward to seeing your students in July! If your university has any applicants to this program, please send us the required documents (the forms are posted on our website) during the application period, from April 1, 2019 to April 30, 2019.
there is no guarantee to meet their requests. If you need more information or help, please feel free to contact me. Greetings from Office of International Programs at Konkuk University, Korea! We would like to announce that applications for 2019 Konkuk University International Summer Program(ISP) are now available! fruitful time here in our Seoul Campus. We would appreciate it if you could pass the program information below to your students who might be interested in joining us this year. For further information regarding the program, please click attached pdf file to view a copy of the program pamphlet and application form. As for our partner university students must be first nominated by their home institution to receive partner university discount. We do not have a limitation to student applicants from our partner university. However, since the maximum number of students we can accept for this short program is 60, if the total number of nominees exceeds our limit, we will need to reduce the number of nominees from each institution. If you are interested to form short-term program based MOU with our university please do not hesitate to contact me. If you have any questions, please feel free to contact us at klm23086@konkuk.ac.kr or intl_programs@konkuk.ac.kr. Warm greetings from Chonnam National University, Korea. I am writing on behalf of Professor Kiseok Moon, Dean for International Affairs at Chonnam National University, Korea. 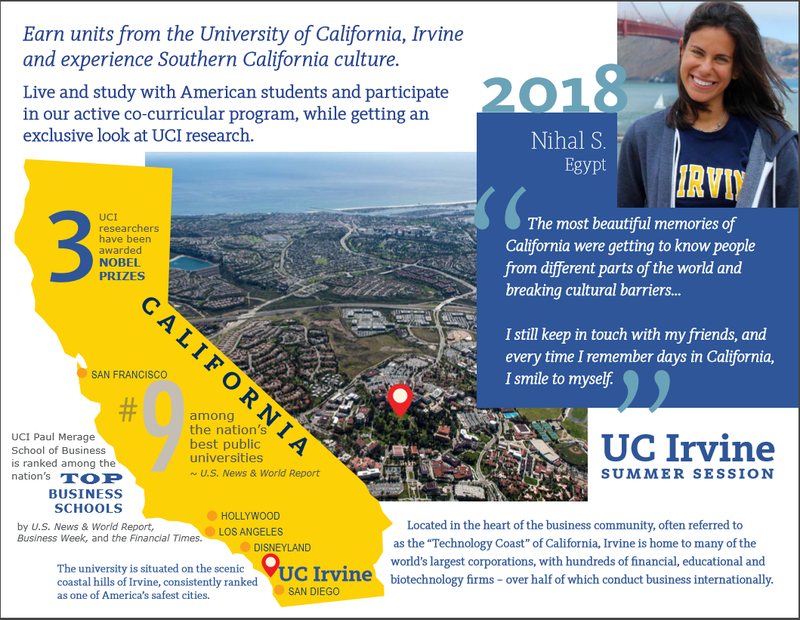 I am delighted to introduce a chance to study and travel during the four-week period over this summer in the Chonnam National University International Summer Session 2019(CNUISS 2019). Last year, we invited 130 international students and 15 professors from our partner universities and they were very satisfied with their one month stay at CNU. The courses we offer have a length of 4 weeks and are taught by the professors of proven expertise and experience in the most leading-edge areas of knowledge of our university and partner universities abroad. Students can take up to two classes and get six credits and travel across Korea with the international students from 25 different countries along with Chonnam students. Class Setup: A mixture of Korean students and international students. CNU would like to host 3 students for CNUISS 2019 with tuition and dormitory fee waived and another 3 students with full fee paying status if there are more demands. After you nominate student participants, please fill out the attached excel file and send it to me by March 8, Friday. We will contact the students directly and guide the online application link and payment method after your nomination. We are sure that your students will have an unforgettable study abroad opportunity this summer in Korea. We appreciate your cooperation in advance. Should you need further information, please do not hesitate to contact me. We look forward to welcoming your students this summer! Mevlana Exchange Programme is a programme which aims the exchange of students and academic staff between the Turkish Higher Education institutions and higher education institutions of other countries. Mevlana Exchange Programme Bilateral Agreement: A valid bilateral agreement is required for student and academic staff exchange. The bilateral agreements is valid for five years. Exchange of Students: - The students registered to the vocational schools (2nd class), bachelor’s degree (2 nd, 3rd, 4th classes), master, doctorate programme (after the first semester excluding the language or scientific preparation semesters) programs of the universities can benefit from Mevlana Exchange Programme. Turkish citizen students who study in foreign university unfortunately couldn’t apply to Mevlana Exchange Programme. Grade Point Average (GPA) should be at least: 2.5/4.0 for students vocational schools and bachelor’s degree, 3.0/4.0 for the Ms and PhD students, the score of language of which the host institute us for teaching. 23.01.2018 the Council of Higher Education Executive Council Decisions: It has decided as follows in compliance with the specified area as student (incoming/outgoing) and academic staff exchange with countries listed below. Resident Permit: Incoming student should apply for his/her resident permit in a month after his/her arrival in Turkey. Insurance Documents: Incoming students should bring their insurance documents with them. The insurance should be valid in Turkey. Educational Expences: During the exchange mobility, the participant students must pay the required tuition fee to their home higher educational institute. They don’t pay any tuition fee to the host university. Finantial Support: For Academic Year 2017-2018, Turkish Council of Higher Education (YOK) will pay 1200 TL for incoming students per month. 80% of the scholarship is paid to students per month after their arrival to SDU. The rest of the scholarship will be paid based on the ratio of total credits of the succeeded courses to the courses that the student is obliged to take. The scholarship includes only for four months. Academic staff (professor, associate professor, assistant professor, lecturer) can participate to Mevlana exchange Programme. Research assistants could only participate as a student. Academic staff should give courses at least 6 hours per a week. Academic staff can participate Mevlana Programme min. 2 weeks and max. 3 months. For Academic Staff on Main List: Academic Staff Mobility Programme, Letter of Acceptance, Academic Staff Declaration, Information Form, Academic Staff Final Report (before leaving SDU), Academic Staff Declaration of Attendance. Burapha University, Thailand, an AUN member university, is pleased to announce Burapha University Summer Camp 2019, which will be held on 12 - 19 May 2019 at Burapha University, Chonburi Campus, Thailand. This Summer Camp is open to undergraduate students enrolled in any disciplines in non-Thai AUN Member universities and ASEAN+3. There are 15 seats available for international students and 15 seats for Burapha University Thai students. The camp will is funded by Burapha University including accommodation, transportation, camp fee and all meals. The travel costs from and to their home countries, visa fee, travel insurance and other personal expenses are not included. The applicants can submit the application to grc@buu.ac.th by 8 April 2019. After the selection of 15 finalists, Burapha University will email to the selected applicants on 12 April 2019. Thank you for your kind cooperation and support. Each of the activities are expected to benefit the participants and the AIMS Programme at large, especially in terms of enhancing its visibility and information accessibility. Through this email, we are happy to inform you that PSU will conduct the 2nd Authentic Thai Camp in August this year, thanks to the successful 1st program held last year. In August 2018 we had 24 excellent students from two universities in Japan and two universities in China joining our great summer program together with 8 wonderful Thai students as their buddies. Therefore, we are pleased to invite students from your respected university to participate in the PSU Authentic Thai Camp 2019, which will take place from August 18 - 31, 2019 (arrival day Sunday, 18 August, and departure day Saturday, 31 August). There will be 14 amazing days in the “Land of Smiles” for all participants, full of cultural discoveries: Thai language, Thai cooking, Thai boxing, Thai music, Thai dance, Traditional Thai Medicine, field trips and excursions to famous tourist places and more. PSU is happy to provide big discounts from 10-25% to the participants from your esteemed university, as the discounted rates enclosed herewith. These reduced fees can apply to the Early Bird Rate if payment is completed before 30 April 2019. Participants from PSU partner universities benefit of discounts only if they are nominated by their university via the attached Application Form. Individual applications are possible, but no discount will apply. Please be informed that the number of participants is limited and they will be accepted on the basis of “first-come, first-served” and we may close the applications once the seats are fully booked. Therefore, kindly nominate your student as soon as possible, in order to ensure seats for them. We would really appreciate if students applying are sure that they are able to come during the aforementioned period of time to PSU, in order to not keep booked the seats in disadvantage of other applicants. For your information, we will provide airport pick-up (arrival) and drop-off (departure) at Hat Yai International Airport. Please find attached the official Invitation Letter, Camp’s brochure, Tentative Program, Camp’s Details, Discounted Rates and Application Form for your further process. Should you have any inquiry, please do not hesitate to contact me. Thank you for your kind consideration and we look forward to hearing from you. please forward these documents to them. It will be our great pleasure to receive applications by your students. I’m pleased to inform you that office of international affairs at Chonnam National University has received a nomination list from each partner university by April 30th, Tuesday. Please fill out the attached nomination file for CNU exchange student program Fall semester in 2019 and send me through email. Always thanks for your cooperation. We are pleased to announce that application for the Student Exchange Program at Niigata University 2019 Spring Semester is now open. Application must be submitted by postal mail by May 31, 2019. Attached please find an official letter for this announcement. Guidelines and forms may be downloaded at the following website. Please be reminded that the photos for visa application should be sized 4cm X 3cm. Application is rejected by Immigration Bureau if the photo size is not suitable. Also, graduate students need to apply for each graduate school directly.